I'm in love.......with Lanvin's SS2013 Snake Wedge Derby!!! I just love the detailing on this pair of shoes. The sole definitely add some height to any one so unless you are a basketball player, this is a good news. I also like the snake wedge that Lanvin snuck in at the heel. Somehow with that extra wedge, Lucas Ossendrijver made this derby looks like it's on double soles. Just brilliant! 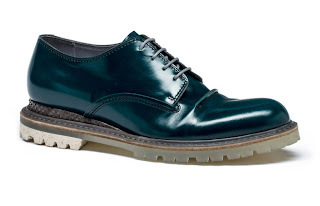 These pair of derby is available now at Lanvin's own website.